Former fisherman Tun Lin, who was trafficked from Myanmar to Thailand and lost four fingers when he was stranded on a boat for years, speaks during an interview in Samut Sakhon, Thailand, March 25, 2018. 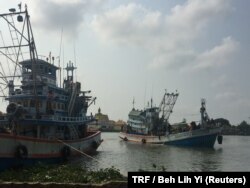 "It was like a floating prison - actually, worse than prison," the Burmese fisherman, who was sold into slavery, told the Thomson Reuters Foundation in Samut Sakhon, a Thai fishing hub some 40 km (25 miles) southwest of the capital Bangkok. The 36-year-old, who was rescued in 2015 after losing four fingers and being stranded on a remote island for years without pay, is now lobbying for fishermen's rights with the Thai and Migrant Fishers Union Group (TMFG). Under growing consumer pressure, Thailand has introduced a raft of modern technologies since 2015 - from satellites to optical scanning and electronic payment services - to crack down on abuses in its multibillion-dollar fishing industry. It is one of a growing number of countries using innovation to deal with modern slavery, from mobile apps in India to blockchain in Moldova, but experts warn against over-reliance on tech as a silver bullet without stronger workers' rights. Patima Tungpuchayakul from Thai advocacy group, the Labor Rights Promotion Network Foundation, speaks during an interview in Samut Sakhon, Thailand, March 25, 2018. "Technology can be a double-edged sword," said Patima Tungpuchayakul, co-founder of the Labor Rights Promotion Network Foundation, a Thai advocacy group. "It has become an excuse the government is using to justify they have done something, but in practice they don't use it to solve the problem." A fishing boat pulls into a port in Samut Sakhon, Thailand, March 25, 2018. "We are serious in law enforcement regarding human trafficking and illegal labor cases," said Weerachon Sukhontapatipak, a Thai government spokesman. "There might not be abrupt change ... it will take time." Thailand is also rolling out an ambitious plan, using iris, facial and fingerprint scans to record fishermen's identities to make sure they are on the boats they are registered with and help inspectors spot trafficking victims. "I think people underestimate the size of the ocean and the ability to pinpoint where something as small as a boat is," Smith from the U.N. Office on Drugs and Crime (UNODC) said. "If you have good information, intelligence, then satellite images can be good ... It has to be a small part of a much bigger effort." 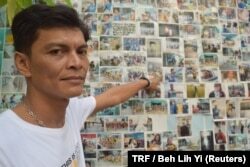 Chairat Ratchapaksi, who founded the Thai and Migrant Fishers Union Group to help trafficked fishermen like him, poses for a photo in front of pictures of rescued trafficking victims in Samut Sakhon, Thailand, March 25, 2018. "That's probably the best way you can start," he said. To combat slavery, firms must improve workers' lives, rather than cutting labor costs and recruiting informally to meet demand for cheaper goods, experts say. "Smaller owners are getting squeezed, and still rely on brokers and agents, who dupe workers and keep them ignorant of their rights and conditions on the boat," said Sunai Phasuk, a researcher with lobby group Human Rights Watch in Bangkok. 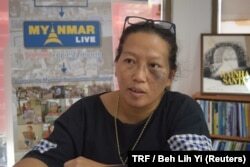 Workers are set to become more vocal with the May launch of the Fishers' Rights Network, which aims to combat abuses, backed by the world's largest canned tuna producer, Thai Union, and the International Transport Workers' Federation (ITF). 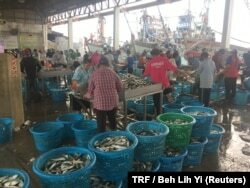 "Without enforceable rights at the workplace and the strength that comes from being represented by a union, labor rights violations and the mistreatment will continue," said Johnny Hansen, chairman of ITF's fisheries section. Migrant workers sort fish and seafood at a port in Samut Sakhon, Thailand, March 25, 2018. Thailand's ratification this month of the ILO protocol on forced labor also offers hope. It is the first Asian country to promise to combat all forms of the crime, including trafficking, and to protect and compensate victims. "We have ... committed to changing the law to allow workers to form unions, so we can work together to solve the problems," said Thanaporn Sriyakul, an advisor to the deputy prime minister. "But the process is long, and it will take time." This would be good news for Lin's fishermen's group, which has helped rescue more than 60 people since 2015, but has no legal status as Thai law does not permit fisher unions, leading rights advocates to use other terms, like workers' groups. "There are still lots of victims, and I want to help them," Lin said. "As fishermen who have suffered in a similar manner, we understand each other's needs and are able to help better." Scan on Exit: Can Blockchain Save Moldova's Children from Traffickers?